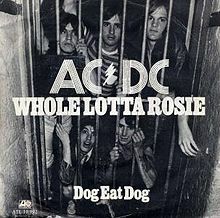 AC/DC have allowed their Let There Be Rock classic ‘Whole Lotta Rosie’ to be used in a trailer for the reboot of Rosanne. The normally cautious AC/DC rarely allow their music to be licenced, although they have made the occasional exception, like when a cover of ‘Thunderstruck’ was licenced for a Holden commercial. The strangest one was allowing ‘Thunderstruck’ to be used in a Colonial First State Bank ad. They’ve also used ‘Thunderstruck’ in an Apple ad. ‘Shoot To Thrill’ was also once used in a DirecTV ad and now ‘Whole Lotta Rosie’ is singing in Rosanne. The new season will feature the original cast of Roseanne Barr, John Goodman, Sarah Chalke, Sara Gilbert, Michael Fishman, Alicia Goranson. Johnny Galecki, who played David Healy and is now stars as Leonard in The Big Bang Theory will return for one episode. Laurie Metcalf, who plays Sheldon’s mother on The Big Bang Theory, will also be in the new show. The original Roseanne aired from 1988 to 1997. The new season will premiere on March 27, 2018.